The final work platform for NASA’s Space Launch System arrived Dec. 13 at the agency’s Kennedy Space Center in Florida. 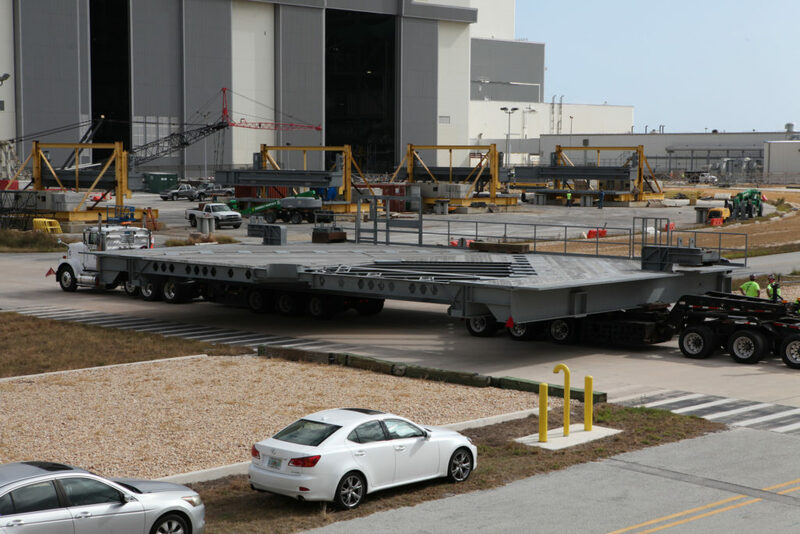 The second half of the A-level platforms, A north, was transported to the center by heavy-lift truck from Tillett Heavy Hauling in Titusville, Florida, and delivered to the Vehicle Assembly Building (VAB) staging area. The platform will remain in the staging area for prep work before it is moved into the transfer aisle of the VAB. The first half of the A-level platforms, A south, arrived at the center Nov. 28. The south platform will be installed in High Bay 3 on Dec. 22. The north platform will be installed in late January 2017. The A-level platforms are the topmost platforms for High Bay 3. The two halves will provide access to the Orion spacecraft’s Launch Abort System (LAS) for Orion Lifting Sling removal and installation of the closeout panels. Testing of the Launch Abort System Antenna also is performed on this level. A total of 10 levels of new platforms, 20 platform halves altogether, will surround the SLS rocket and Orion spacecraft and provide access for testing and processing. NASA is preparing for the launch of Orion atop the SLS rocket from Launch Pad 39B in 2018.